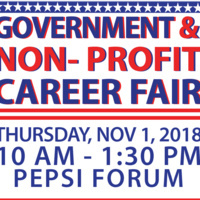 2018 Government & Nonprofit Career Fair on Thursday, November 1, 2018. Connect with Employers for their internship and job opportunities. Be sure to check this event often, for Employer registration updates. Professional dress is required for this networking event. Need to prepare? Polish your resume? Practice interviewing? Have Questions?